First up is keen golfer, Carlos ‘Carlitos’ Tevez. Born and raised in the tough Buenos Aries area of Fort Apache, Tevez has played for some of the biggest clubs in World football – Boca Juniors, Corinthians, Manchester United, Manchester City and of course, West Ham United. Tevez made the controversial move across Manchester in the summer of 2009, after winning two league titles and the Champions League with United. He was never prolific in his time with the Old Trafford club, often played out wide to accommodate Cristiano Ronaldo, that would change though at City. When he signed, City had just finished 10th. When Sergio ‘Kun’ Aguero joined in the summer of 2011, City had finished 3rd and qualified for the Champions League, and had just won the FA Cup. Signed from Atletico Madrid (where he was Fernando Torres’ replacement), he joined City as a replacement for the wantaway Captain Tevez. A child prodigy, he made his professional debut at just 15 years of age for Independiente in the Argentina top flight, breaking the record of future father in law Diego Maradona, and made a big money move to Spain in 2006. After scoring 101 goals in 234 goals for the captial club, only a handful of teams could afford both his transfer fee and his wages, fortunately for City and the Premier League, his new club was one of them. Born just 13 miles from Tevez, Aguero is four years younger. As usual, the statistical comparison will be based on their form in the league, comparing Aguero’s 2011-12 season with Tevez’s debut season with the club. I’ll be looking into the variables and will take a look at their international form as well. For queries on how the calculations are made, see the Rules and Workings page on the menu bar above. First and foremost, the all important measure for a striker – goals scored. Tevez came into his debut City season on the back of a disappointing season fro Man Utd, scoring only 5 league goals (14 in all competitions) after the arrival of Dimitar Berbatov – his worst return since his debut season for Boca. Sergio Aguero was fresh from his best scoring season, hitting 20 La Liga goals (27 in all competitions). The starting point for both was very different, in terms of their own form and the team they were joining. But surprisingly, they had near identical scoring records, both scoring 23 league goals in their debut season’s for the club. In terms of goals per game they both have around a goal every 1.5 games, which is prolific in anyone’s book (apart from whatever book Cristiano Ronaldo and Leo Messi read). Looking a bit closer into the strike rates, and going down to minutes per goal, Tevez actually played almost 300 mintues more than his younger compatriot, or over three games. Advantage Kun. Next up is the lifeblood of this site – looking at the standard of opposition that the players perform against. Those familiar with the rest of the site (are probably related to me), know that there are two main measures, firstly the average rank of the opposition per each of their goals, and the second is splitting the opponents into a ranges – Top 6, Middle 8, and Bottom 6. Basically, it’s a check to see if a player is a Big game player, Flat track bully or Big game bottler. Once again, it’s pretty even on this front. Both players have pretty similar averages, with Tevez scoring against teams ranked on average of 11.52, to Aguero’s 11.13 – Tevez’s extra two goals against the bottom 6 means he has a slightly worse average. Advantage Aguero again. Both players scored four goals against the Top 6 – Aguero against 2nd to 6th, and Tevez against 1st to 4th and 6th. Looking a little closer though and Tevez regains a bit of ground, three of his four Top 6 goals were scored against eventual champions Chelsea, and each time they were decisive goals. In the 2-1 win at the City of Manchester Stadium, Tevez scored the winning goal, and in the 4-2 win at Stamford Bridge, Tevez scored a brace. Big game player? His other goal against Top 6 teams was in a 3-1 win over Villa. Aguero’s goals against the Top 6 were against Man Utd (2nd), Spurs (4th), Newcastle (5th) and Chelsea in 6th. So far, pretty even – with Aguero just about ahead. They’re both goal scorers first and foremost, but how much did they do for their team? Well there’s few in the game that work as hard as Tevez, in terms of closing down opponents, but equally, anyone watching Aguero will notice just how good his movement off the ball is. However, that’s not something I can measure, so how about assists instead? United with two assists in the 4-3 defeat at Old Trafford – a game famous for Michael Owen’s late winner. Aguero on the other hand had a pretty good average ranked opponent per assist, with 9.75. Only one was against the bottom 6, with most against the mid table teams. Like Tevez, he also managed to get two assists against Top opposition, creating Balotelli’s early goal in the 2-1 defeat to 6th placed Chelsea, and then an assist in the 2-0 win over 5th placed Newcastle. Whilst Aguero’s slightly ahead on points so far, it has to be remembered that whilst his City finished in 1st, Tevez finished in 5th. So how about their importance to the team? Well on the basis of points won from their goals (see Rules and Workings), it’s a pretty convincing win for Tevez. That’s pretty comprehensive. Whilst Aguero’s debut season has been very impressive, in terms of their importance to the team, Tevez was miles ahead. He scored almost 32% of City’s goals in 2009-10 compared to Aguero’s 25%. And it’s a similar story in points won, with Tevez winning 22% of the team points, compared to just 8% for Aguero. So that’s another one back for Tevez, but at the end of the day, Aguero did score THAT goal (worth 2 points for those interested, and a Title). So that’s the stats taken care of, anyone wanting to know a bit more? Well Tevez scored five penalties to Aguero’s three, Tevez scored his 23 goals with four shots less (126 to 130) whilst both average one shot on target in each of the games against the Top 6 teams. They’re pretty even, even to that level of detail. In the space of just two seasons, there’s been a pretty drastic change in line up, with just three players in the strongest XI for both seasons. Comparing the midfields in particular that each played with it’s all the more impressive that Tevez managed 23 league goals and seven assists. The two that stand out in particular are the attacking midfielders – City Youth Teamers Stephen Ireland and Shaun Wright-Phillips may have enjoyed some good times with the club, but those days had long passed by this point. Compare them to Silva and Nasri, and you’re an idiot. Each had multiple strike partners with Tevez partnering Adebayor, Santa Cruz and Bellamy at regular times each season, compared to Dzeko, Balotelli and Tevez for Aguero. At the time of writing, it’s 15 goals in 36 caps for Aguero, and 13 in 59 for Tevez. That’s a pretty clear cut win for the younger striker right? Maybe not. Tevez has three World Cup goals to his name, and in the 2004 Olympic games (taken a lot more seriously in South America than here), he top scored with eight goals as Argentina won the Gold. As that was officially an Under 23 Tournament, those eight goals don’t count to his full tally. Both have three Copa America goals, and both scored in 2010′s 4-1 thrashing of Spain. Well the eagle eyed among you will have noticed that I’ve left out Tevez’s 2010-11 season stats, which were pretty important given that he was essentially the difference in qualifying for the Champions League and not. Why? Well I thought it was only fair to compare the debut season of each player, although Tevez did have an unfair advantage of 3 previous seasons in the Premier League. When looking at his 2010-11 stats, he was once again responsible for 15 points, he scored 20 league goals in 31 games (which was enough to see him share the Golden Boot with Dimitar Berbatov), and he had an average opposition of 12.15 per goal, with a split of 6-11-3 for Bottom 6-Mid 8-Top 6 goals. Pretty consistent. He had six assists. It’s fair to say that Manchester City’s recent past has been dominated by the two Argentinians. Tevez was key in changing both the mentality at the club and in qualifying for the Champions League. It was only once that qualification was complete that it was possible to attract players like Aguero. Robinho may have been been the marquis signing of City’s transformation into a superpower, but it was Tevez’s signing that signalled the intent. Not only were they signing a world class talent, but it’s who they were signing him from. Of course moving from Top 4 to Champions is another thing altogether, and although he helped near the end of the season, Tevez’s contribution to City’s greatest triumph of modern times was pretty small compared to Aguero. Although he didn’t dominate the team like Tevez had previously, he was the top scorer and he scored the goal to win the title. 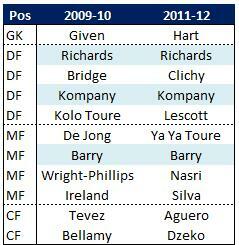 That one moment is the biggest single contribution that any player made tonL City’s title win. All the work before hand, including Kompany’s winner against United would have counted for zero. So in what is no way a cop out, it’s a draw! !